Tennessee. First day should be around 425 miles. miles for Friday will be right at 400. On Saturday, the riders will head towards San Antonio and the perfect photo shot in front of The Alamo that exemplifies their cause, "Never give up, keep fighting". The Riverwalk restaurants await the guys (and lady) after about a 475 mile day. Riding through Houston is always an interesting challenge, no matter what time of day or night, so the gang is prepared to skirt that lovely city if it appears that Interstate 10 is one Houston-long traffic jam. On Sunday, the longest riding day, the gang will leave San Antonio and ride across the wide open West Texas scenery, dodging tumbleweeds and enjoying the 550 miles to El Paso. At some point on this day, the gang will have a "Youngest Rider / Silliest Stunt" competition (off the bikes, of course), with Brother Hezikiah, Moe, Pat, and Brooklyn competing for the honor while the geezers Grits, Unka Bill, Wayne, and Greg look on from the sidelines, and The Lady Alice bears it all with her usual humor and good grace. On Monday, the gang will meet up with Chris Babbie in Tucson, Arizona for a bit of desert hospitality and perhaps a little sightseeing in the Old West, before riding off into the sunset to their stop for the night near Casa Grande, Arizona. Tuesday morning will see the gang leaving Casa Grande very early, changing from Interstate 10 to Interstate 8, and riding into California at Yuma. Riding through the Imperial Sand Dunes Recreation Area, "Grits" and "Unka Bill" will have a dune-climbing contest (without their respective motorcycles), while everyone else takes bets on which of the two oldest of the group will make it to the top without a coronary. Wayne and Greg will continue to disparage the other's choice of motorcycle, as they will have done the entire trip. The scenery on I-8 is absolutely spectacular as you climb above and then drop down into San Diego, where the gang will again enjoy the hospitality of "Grits'" family, as they have a nice lunch at his home. 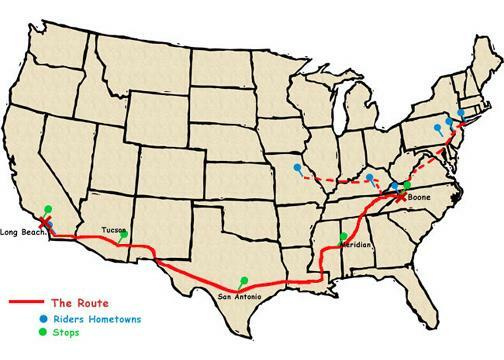 The riders' only regret is that Grits doesn't have more relatives along the route! Tuesday afternoon the gang will head up the coast to their destination, the USITT 2004 Convention & Expo at the Long Beach Convention Center. Big plans are underway for an end-of-the-ride party at a local restaurant, and the gang hopes that if you're at the convention, or even anywhere near the city of Long Beach, that you'll join them around 7:30 or 8:00 for a great time commemorating this "wonderful ride for a wonderful cause". Check the website often for updates on exact timing and location.Thursday through Saturday in Long Beach, in the Expo Hall, you can come by the Sapsis Rigging booth on the Expo floor and see the bikes on display, talk with the riders, hear the road stories (both true ones and not-so-true ones!) and continue to help out by donating generously to the cause.